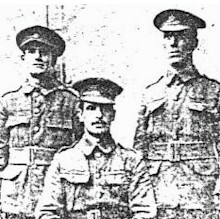 Alfred William Preston (Shown in the group of men in the photograph) enlisted as a Private in the 7th Battalion Sherwood Foresters in August 1914 and after over two years War experience in France2, during which time he was wounded twice, he was killed in action on 16th September 1917. He was killed instantly by a bullet from an enemy machine gun. Alfred was born in Beeston three months after his father died at the early age of 37. His father Alfred and his mother Ann (née Taylor) had married in the Ibstock area of Leicestershire in 1875, where Alfred worked as a pumping engineer and wher their first three children were born, After a brief period in the Coalville area, the family moved to Beeston around 1884 where Alfred senior found work as an engine driver.. In all, the couple had had at least ten children but, by 1911, most had married or had died young and, at the age of 20, her son Alfred had became the main support to his widowed mother. At the time of the 1911 census she was living at Windsor Street, Beeston with Alfred, who had found works as a labourer at Ericssons and his youngest sister Susan, who also worked there as a polisher3. Mrs. Preston's eldest son Albert Edward, a married man, born in 1876, whose home was at 11 Abbey Road, Beeston4, served as a private throughout the War5. Albert had worked at Beeston Boiler Company as a moulder before enlisting and was able to return there as foreman moulder following his release in 1919. Cambrin Military Cemetery - Cambrin is a village about 24 kilometres north of Arras and 8 kilometres east of Bethune on the road to La Bassee. The Cemetery is on the north side of the road and is approached by a path from the main road. At one time, the village of Cambrin housed brigade headquarters but until the end of the First World War, it was only about 800 metres from the front line trenches. 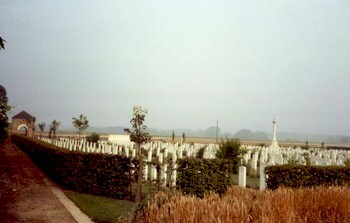 The village contains two cemeteries used for Commonwealth burials; the churchyard extension, taken over from French troops in May 1915, and the Military Cemetery "behind the Mayor's House". Cambrin Military Cemetery, often called Cambrin Chateau Cemetery, was begun in February 1915 and used as a front line cemetery until December 1918. It contains many graves of the Battle of Loos and in row D there are buried 57 officers and men of the 1st King's (Liverpool Regiment) who died on the first day of the battle, 25 September 1915. 31911 Census Piece 1223 RD429 SD3 ED5 Sched 15. The family had lived at 8 Victoria Terrace, Windsor Street soon after their arrival in Beeston (1891 Census Piece 2671 Folio 68) and had previously lived at Crown Yard, Beeston (1901 Census Piece Piece 3153 Folio 57). By the time that Alfred's name was recorded by the Commonwealth War Graves Commission, Ann's adree is given as 41 Dallas Yorke Road, Beeston. 41911 Census Piece 1223 RD429 SD3 ED1 Sched 345. He was then living there with his wife Florence (née Hardy) and their three children, Elthel Annie, Lawrence Albert and Elsie Vera. He is still listed there in a directory dated 1952. 5Albert Edward's Service Record has survived. It indicates that he attested at Nottingham on 5 January 1915 and joined the Sherwood Foresters initially (number 21754). It appears that he served on the Home front throughout the War, transferring to the Labour Corps on 23 June 1917. However,, on 23 July 1918, he was transferred to the 6th Yorkshire Regiment (number 64759) and served on the Russian Front from 15 Oct 1918 to 15 July 1919 as part of international support of the White Russians against the Bolsheviks. He was demobilised on 25 July 1919.